We know it’s a great feeling to have friends and family drop by for a meal or a quick chat. We also know how tiring it can get to whip up some food at the last minute, especially after a long day at work. Take a look at our top picks for some quick, easy and delightful party appetizers for such occasions. These crunchy carrot fries are really easy to put together and are great to serve with your aperitifs. Unlike what the name suggests, these are really healthy as they are baked (and not fried). You can even leave the flour out of the recipe if you so wish, although it does give them a lovely, crisp coating. We suggest you play around with this recipe, adjust your baking times and try it with parsnips or even potato wedges for an added twist. 1. Preheat your oven to 450°F and line two baking sheets with parchment paper. 2. Peel and chop the carrots into French fry-sized pieces. 3. If you are using rice flour, toss the carrots in the flour and line them on the baking tray after shaking off any excess. Bake for 7 minutes. 4. In the meanwhile, mix together the oil, Garam masala and salt in a bowl. 5. Toss the semi-baked carrots in this mixture before baking again for about 10 to 15 minutes until tender. You can tell when they are ready when they are slightly brown along the edges. 6. Serve with your favorite dip! These appetizers make you feel as warm and fuzzy as their name suggests. This rich take on the classic finger food is a favorite with meat lovers everywhere. The caramelized onions add a jazzy touch and feel free to substitute the Chinese mustard with any of your preferred ones. This recipe is really easy if you like working with pastry; it might take you longer the first time if you aren’t. It gets easier with practice. Trust us, it’s worth it! 1. Preheat your oven to 375°F. Chop the onion finely. Chop the hot dogs into bite-sized pieces. Don’t have enough time to play around with pastry? Try our Pork with Bbq Sauce Wrapped in Bacon appetizers! Why not combine two of everyone’s favorite snacks for a fun snack? This pizza-flavored popcorn is sure to bring a smile to your guests’ lips. It’s great for a movie night, too! 1. Toss the popped popcorn in a large bowl with the olive oil. 2. Add the remaining ingredients and toss again. These are really easy to make, even if they need a little planning in advance. Marinade your vegetables before you leave for work so you just need to bake them once you get home. You can use beetroots, carrots, parsnips or any of your favorite veggies to make these delicious (and healthy!) skewers. 1. Cube your chosen veggies. 3. Marinate your vegetables in a large Ziploc bag for at least 2 hours in your refrigerator. 4. Place the vegetables on a baking sheet in a single layer and roast for about 30 minutes in a preheated oven at 450°F. 5. Thread the roasted veggies onto to skewers and serve. 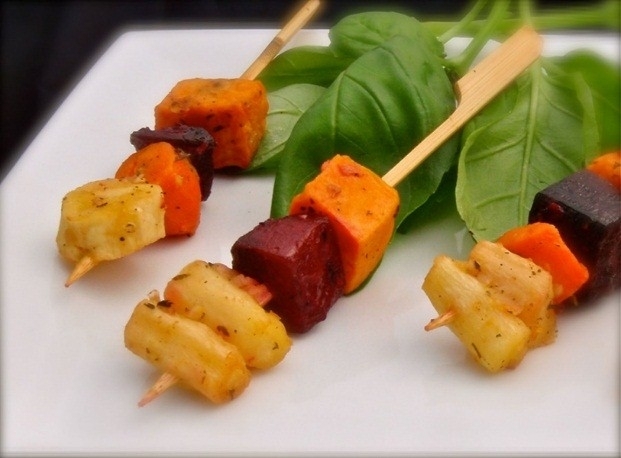 Alternatively, you can try our Root Vegetable Kabobs. Try this fun coconut rum flavored shrimp that your guests will absolutely love! This hassle-free recipe lets you throw it together whilst you are sipping your drinks and the conversation is flowing! 2. Marinade the shrimp for about 30 minutes. 3. Thread the shrimp onto skewers and grill for about 6 minutes until cooked. 4. Turn them midway through grilling and make sure to baste them with the marinade occasionally. Serve with a pineapple dip to really bring the tropics home! If you have too many guests to cook for, try our Malibu Coconut Shrimp.